Eight persons B, C, F, K, M, T, V and W are sitting in a circular table with equidistance from each other and all of them are facing away from the centre. 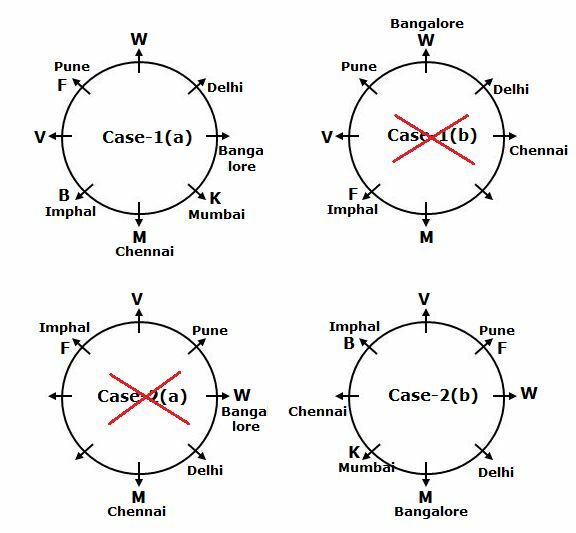 They all are belongs to different cities viz., Delhi, Chennai, Mumbai, Pune, Jaipur, Imphal, Bangalore and Patna but not necessary in the same order. Only two persons are sitting between M and the one who belongs to Pune. V sits to the immediate left of the one who belongs to Pune. 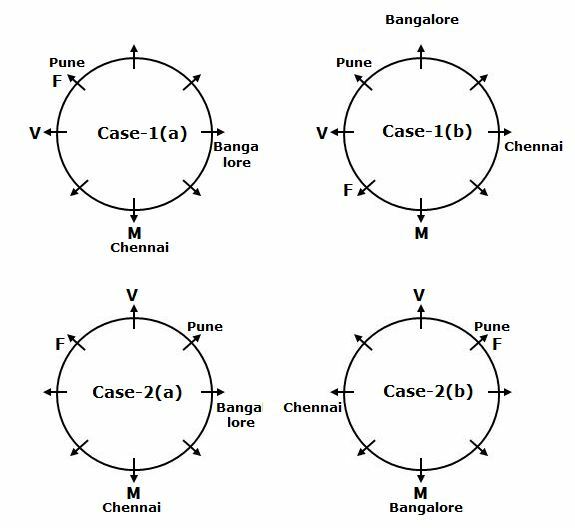 The one who belongs to Bangalore sits third to the right of F, who is an immediate neighbour of V. The one who belongs to Chennai sits second to the right of the one who belongs to Bangalore. The one who belongs to Imphal sits third to the left of W. The one who belongs to Delhi sits opposite to the one who belongs to Imphal. F does not belong to Delhi. W does not belong to Chennai. K sits second to the left of B and belongs to Mumbai. As many persons are sitting between M and the one who belongs to Jaipur is same as between T and the one who belongs to Mumbai. C does not belong to Chennai. 1. 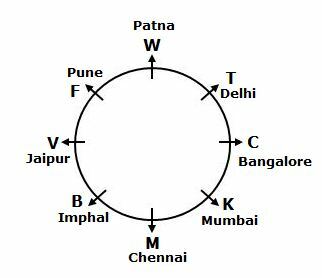 W belongs to which of the following cities? Only two persons are sitting between M and the one who belongs to Pune. V sits to the immediate left of the one who belongs to Pune. The one who belongs to Bangalore sits third to the right of F, who is an immediate neighbour of V. The one who belongs to Chennai sits second to the right of the one who belongs to Bangalore. The one who belongs to Imphal sits third to the left of W. The one who belongs to Delhi sits opposite to the one who belongs to Imphal. F does not belong to Delhi. W does not belong to Chennai. K sits second to the left of B and belongs to Mumbai. As many persons are sitting between M and the one who belongs to Jaipur is same as between T and the one who belongs to Mumbai. C does not belong to Chennai. 3. How many persons are sitting between K and the one who belongs to Jaipur, when counted from right of K? 4. If all the persons are made to sit in alphabetical order from B in anti-clockwise direction. Then how many persons will remain in their original position (Excluding B)? 5. Who among the following belongs to Bangalore? Direction (6-10): In each question below is given a group of letters followed by four combinations of digits/ symbols numbered (a), (b), (c) and (d). You have to find out which of the combination correctly represents the group of letters based on the following coding system and the conditions that follow and mark the number of the combination as your answer. If none of the combination correctly represent the group of letters, mark (e) i.e., ‘None of these’ as your answer. ii) If both the first and the last letters are vowels both are to be coded as the code for first letter. iii) If the first letter is a consonant and the last letter is a vowel their codes are to be interchanged. 6. What will be the code for ‘MPHGBO’? 7. What will be the code for ‘PAOLHW’? 8. What will be the code for ‘EQZOGS’? 9. What will be the code for ‘OBKSWA’? 10. What will be the code for ‘QIABKH’? 1) W belongs to which of the following cities? 3) How many persons are sitting between K and the one who belongs to Jaipur, when counted from right of K? 4) If all the persons are made to sit in alphabetical order from B in anti-clockwise direction. Then how many persons will remain in their original position (Excluding B)? 5) Who among the following belongs to Bangalore? 6) What will be the code for ‘MPHGBO’? 7) What will be the code for ‘PAOLHW’? 8) What will be the code for ‘EQZOGS’? 9) What will be the code for ‘OBKSWA’? 10) What will be the code for ‘QIABKH’?